We all know that quilting is all about the FABRIC, but if you were to compile a list of your favorite quilting tools + resources, what would make your “Top 10? We love discovering new quilting tools, but there are few ol’ faithfuls we use almost daily. And for fun, we’ve compiled our “Top 10” for you into a pdf with product links. Grab Our Free Quilt Tools List! These are the tools we use almost daily and for every project. 1.And this is DEFINITELY our #1: Juki 2200 QVP Mini. 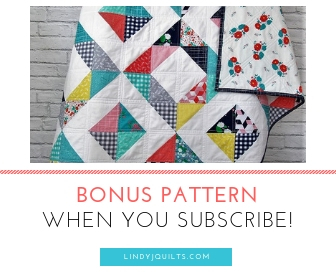 Simple + Stunning quilts require simple and stunning straight seams and this machine does the job! Totally worth the investment! We have older machines that serve as backup when our Jukis are being serviced, but the Jukis are worth their weight in fabric!!! 2. Walking Foot and ¼” Quilting Foot – we pretty much don’t use any other presser feet for our quilts. 3. Olfa 24” x 36” Self-Healing Mat + 44mm and 60mm Olfa Rotary Cutters – We are all about some Olfa products. 4. Various Scissors – can’t have too many of these available! 7. Thread – Aurifl all the way. 9. Color Catchers – If we’re working with dark, red, or purple fabric, we pre-wash it with these color catchers. Life. Changing. Saves us from quilt bleed heartache down the road. 10. Iron and Iron Board – we use standard irons that give out lots of steam, but we prefer a really wide ironing board. We’ve also listed our some of our favorite Quilt Fabric Shops + Blogs on our pdf. So download the attached PDF that links to all the tools we use and check it out! What can’t you quilt without? Give us your top 3 quilting tools in the comments below. P.S. This blog post contains affiliate links, but we are only promoting products we use and endorse!